Firstly I'd like to apologise for the white fabric used as the backdrop; at the time of photographing it I didn't have any paper that was large enough, it didn't stop me though. Now on to the review! 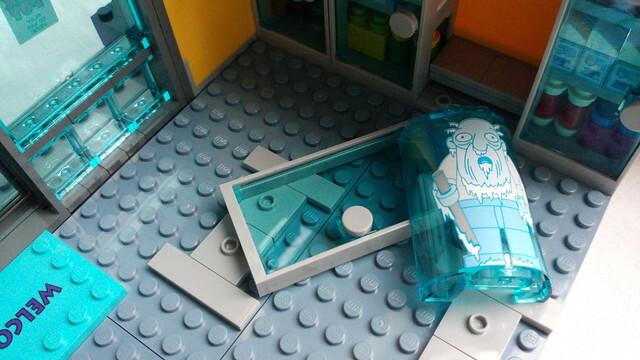 When The Simpsons theme was announced many people were very surprised and shocked that LEGO would be making sets based off The Simpsons TV show. 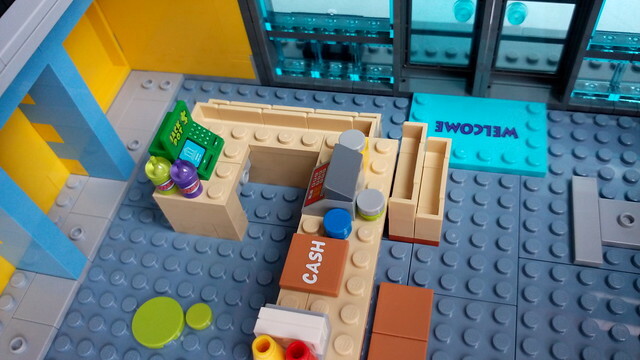 We all expected several smaller playsets however it turned out that LEGO as brave enough to kick off a brand new theme with a direct to consumer set and a licenced collectable minifigures series. The Simpsons yellow banner is still the same which is nice to see. I like that it has studs all the way across it with an odd appearance of a pair of eyes. 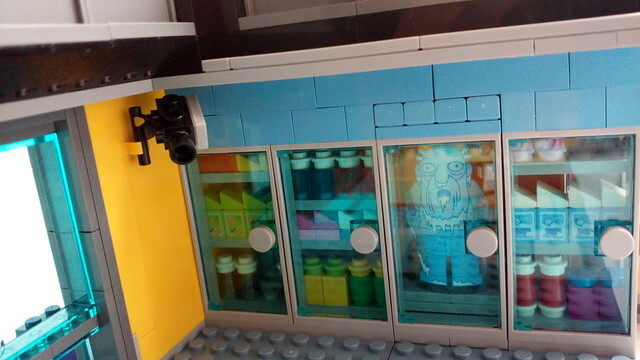 The front has a basic shot of the set in context and two small windows showing that it opens (top right) and the minifigures in the bottom left. 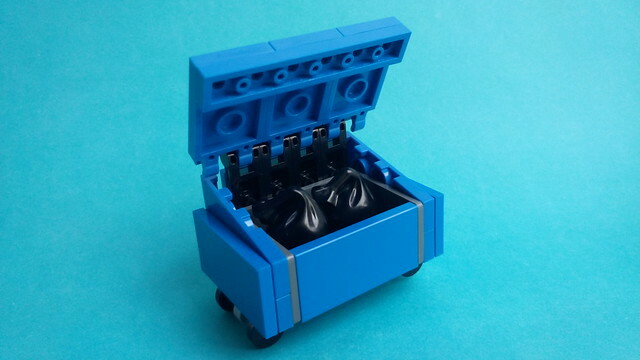 Don't be fooled that most of the accessories that are shown in the minifigures hands aren’t additional ones; the coffee, Doughnuts, Squishee and the black sack are all placed in the set as the instructions state. The ones I didn't mention are separate from the actual set. The biggest surprise about the box is the back; they decided to give you two different shots of recordings from the two security cameras in the store which is very cool and convincing. 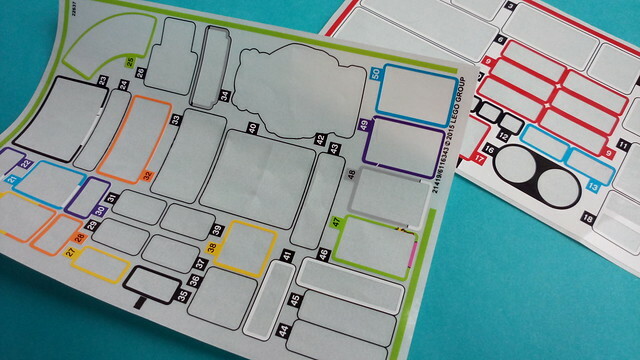 The other scenes and scenarios are boarded with rectangles or circles. In the top right it has two planes of the set; top without roof and the roof removed. At the bottom they give you a very small bar with all the exclusive pieces and the quantities. And finally at the top of the box it gives you a selection of some of the impressive sub-assemblies in the set. It took 12 hours, the care and patience to apply over 50 stickers took up a good chunk of the time. 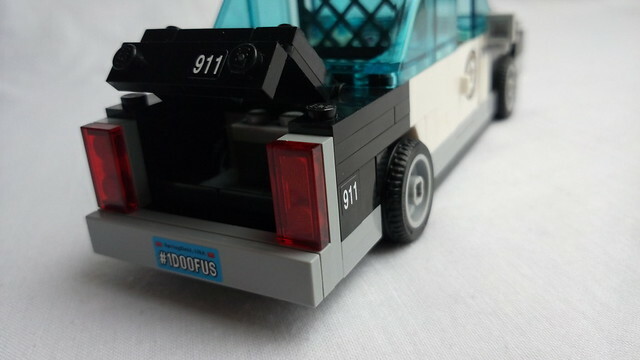 This set contains 16 numbered bags (1-8) and one unnumbered with several 8x16 Sand Blue plates; you also get two 8x16 Medium Stone Grey plates and three train bases loose in the box. This set has the square bound instruction manual and two large sticker sheets hat are sealed in a plastic sleeve. When I first saw pictures of the set it seemed quite simple just like The Simpsons House, but actually Marcos has incorporated some pretty neat building techniques. 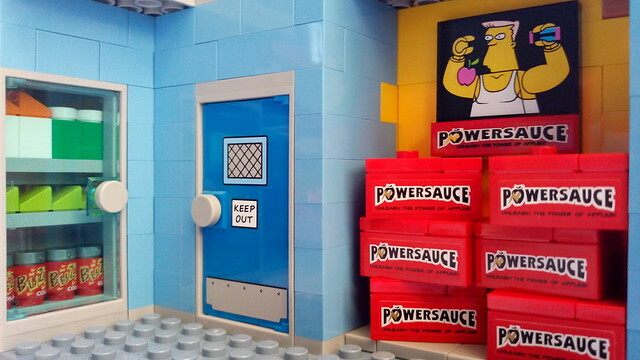 These Simpsons sets are exactly like Modular Buildings but with simple designs from the nature of the show; they have their own unique style and charm. I enjoyed the build; it's pretty straight forward with very nice small assemblies and accessories that make these Simpsons sets stand out. 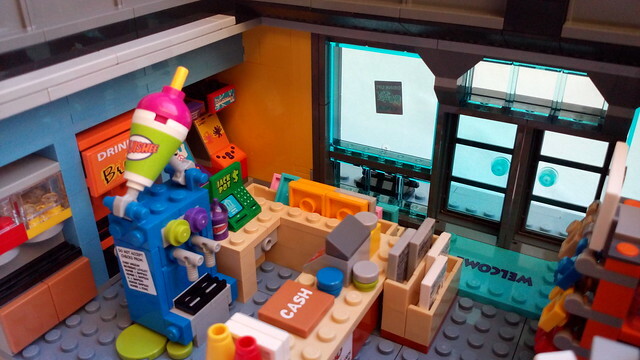 Normally LEGO sets focus on the exterior but this has a jam-packed interior, much more than the Simpsons House. 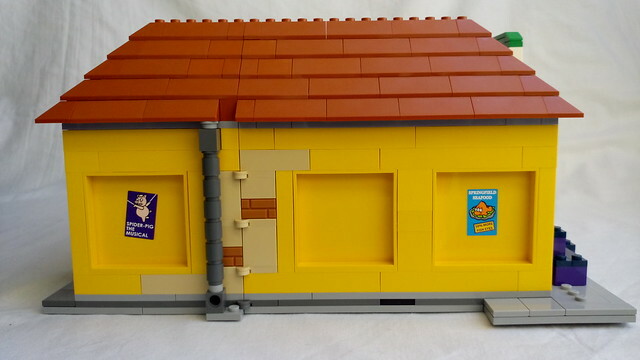 The build is very similar to the Simpsons House. I was disappointed to find several pieces that have dented corners; however I did manage to hide them away in the internal structures. 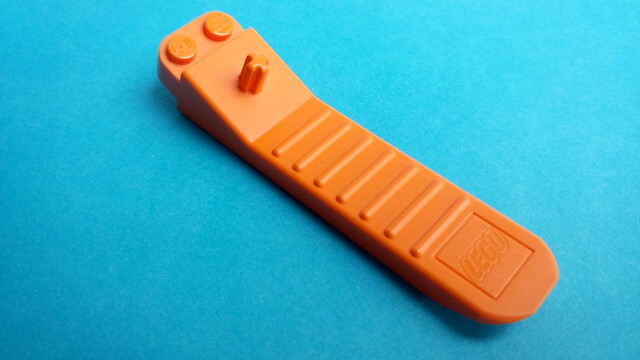 ...Don't forget the very handy Brick Separator! 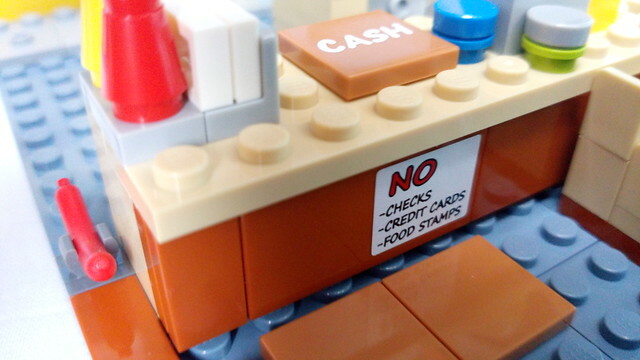 Arguably the weakest aspect of the set is the minifigures. 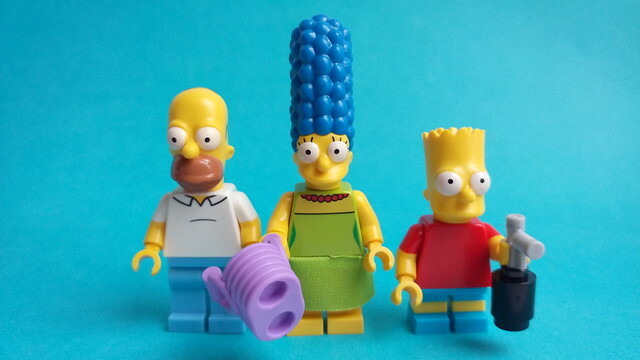 This set recycles three members of the Simpsons family: Bart, Homer and Marge. For those like me who are collecting the entire Simpsons theme it would be a waste to get multiples of the same figures. This would have been a great opportunity to include different facial expressions or different clothing. On the other hand if you are getting this as a one off or you missed out on the first Simpsons collectable minifigures series, now is your chance to catch up! Since I haven't reviewed or ever expressed my thoughts on the Simpsons minifigures in a set review, I thought now would be a good time for me to express my thoughts on The Simpsons minifigures. 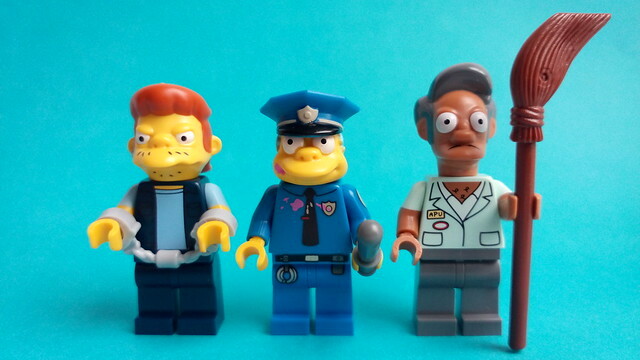 I like the Simpsons head molds because they give a wacky and comical feel to the minifigure with all the odd shapes and sizes. 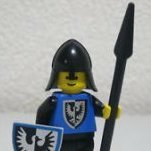 Having the traditional minifigure head wouldn't have worked as well however it does concern me that LEGO will produce less minifigures and recycle the head pieces in the years to come since they have make a new mold for each character. Judging the way it's going with the Simpsons collectable minifigure series I don't see that happening but it's a shame that when you pay for a set this size you do expect a couple of exclusive characters and minifigures. 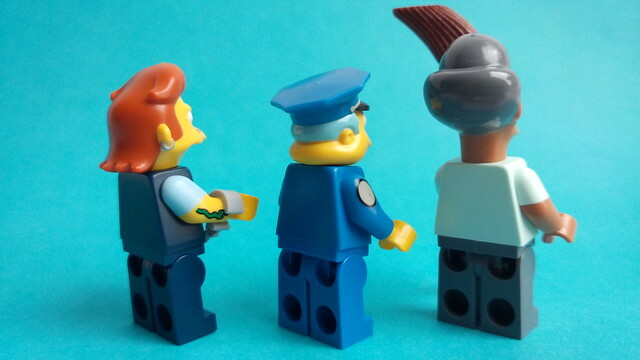 Homer and Bart are perfect minifigures they both have their respective clothing. 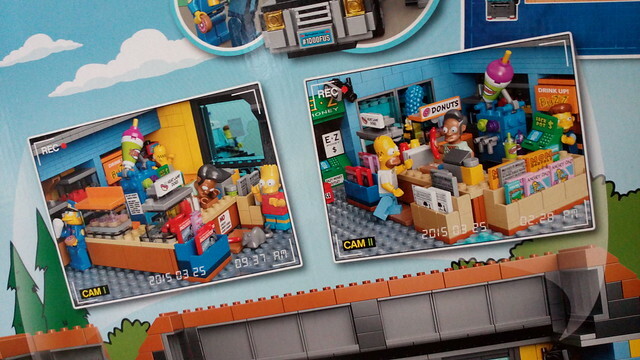 The colour of Bart’s torso is wrong but that's going to happen since it's not like LEGO has every shade of each colour. The red torso works just fine and the new addition of molded sleeves, shorts and shoes really make these minifigures stand out. Marge is wearing her traditional lime green dress and her beaded necklace which continues on the back of the torso. Her towering hair is perfect and has a small hole on the top for possible customisation using the LEGO Friends accessories. One huge problem I have with her design is that she is bare foot! They could have easily molded her legs in two different colours as shown with Bart. This is the third Marge and still no updated design. Like many others I also don't like that the fabric piece has a gap, maybe if it was a little longer that could easily be covered. We get two new variants of Chief Wiggum and Apu. Chief Wiggum's has his police uniform covered with the left overs and crumbs of the doughnut he just ate, interestingly the also added some around his lips. This is the kind of updated variants I don't mind getting, they are small but they are effective. Apu comes in a different outfit with is name tag. His torso is a very pale blue almost aqua. Snake is exclusive to this set. His torso's is one of few that are much more detailed than the other Simpsons characters with his blue t-shirt and dark blue jacket. As with all the Simpsons head molds this is no exception; it’s pretty accurate to the actual show. His tattoo is separate from his t-shirt; it must have been an error in production. 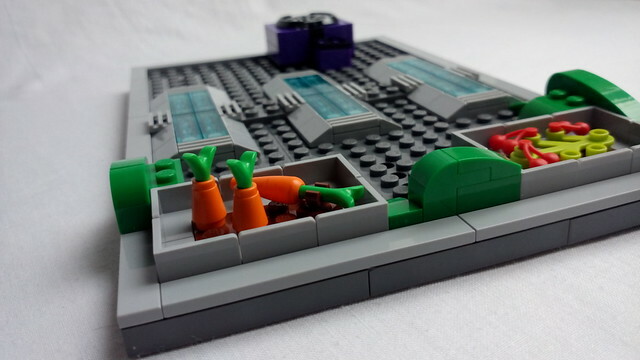 This set has three great exclusive minifigures that we properly won’t ever get again. 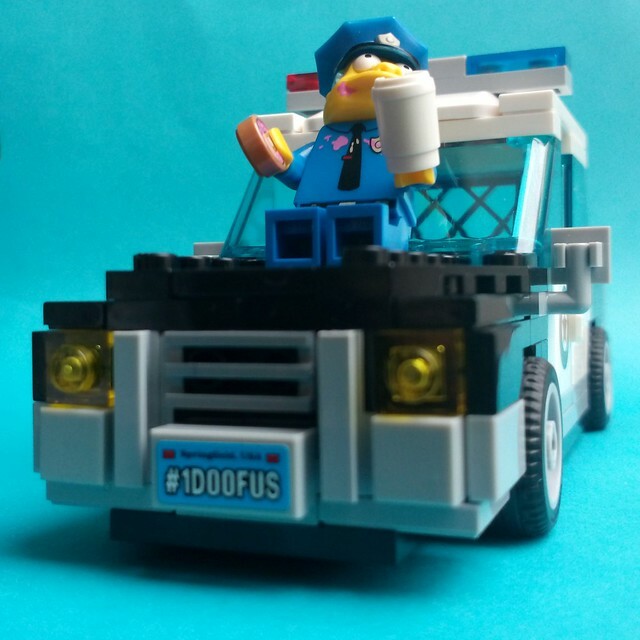 I just wished we got a Lou minifigure to pair him up with Chief Wiggum. This is another dolls house playset which great for both playability and display. 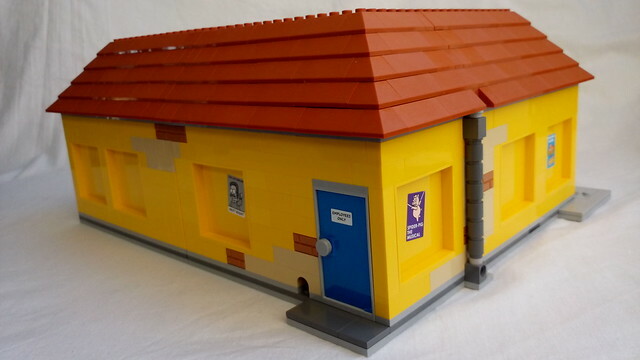 Like the Simpsons House this set also gives you both options of accessibility: hinged and removing the roof. Marcos has decided to split the back sections in to halve which I believe gives you more access for play. Having the doll's house effect makes these models feel classic and vintage. 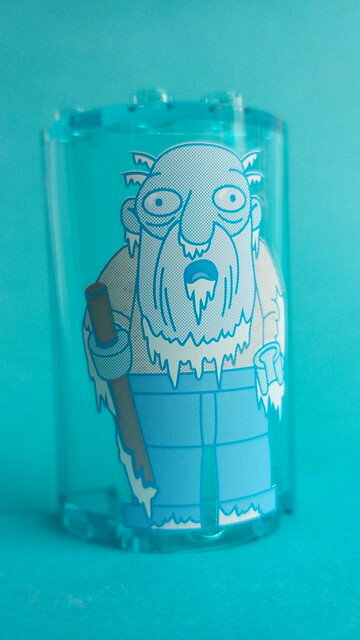 In the Jasper section of the freezers you can pop out the door and take out Jasper and make him melt on the floor. 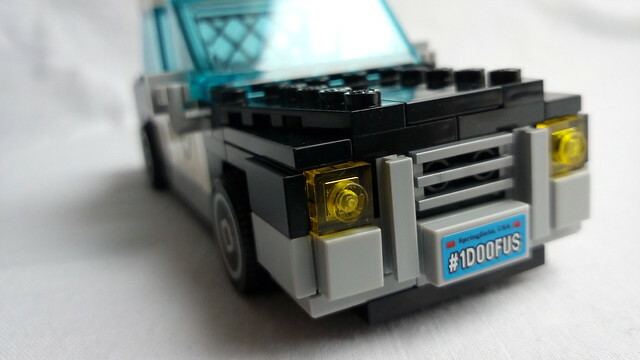 You also have a Chief Wiggum's police car other than that it's just loads of detailed interior which you can play with and most of them can be removed for easy accessibility. Again it’s how toys used to be where it was just one simple feature and your imagination does the rest. 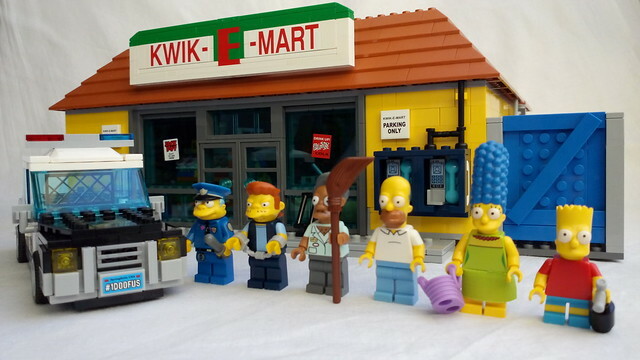 I wish we got Marge’s car in this set as she is doing some shopping. Chief Wiggum's Police car is much like the Simpsons pink car. At least this one has a roof! The front of the car is a very unusual way of building up details on cars normally it's just a plate or slopes but this one has the 1x2 plate with rail near the centre. 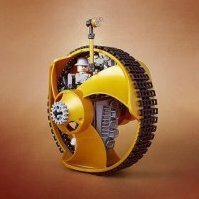 It's very funky looking. 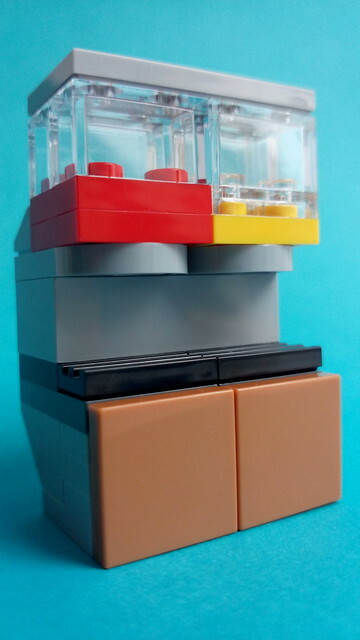 You can fit two minifigures at the front and one at the back. Nice detail that the used the classic fence piece. I see many people adoring the doughnut sitting on the dashboard but I hate it, it's very out of place and doesn't match with the doughnut piece in any way. 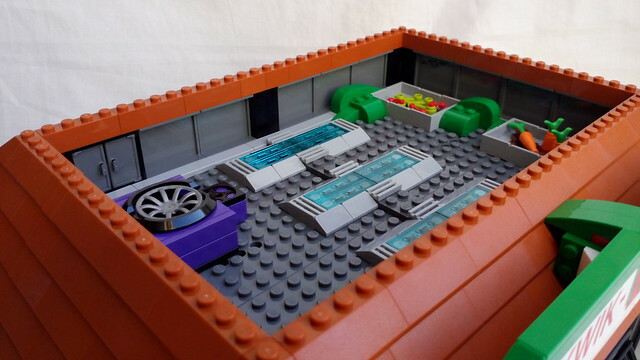 You will need to deconstruct the roof and the windscreens to easily place your minifigures since Marcos has cleverly made the base of the car very low. 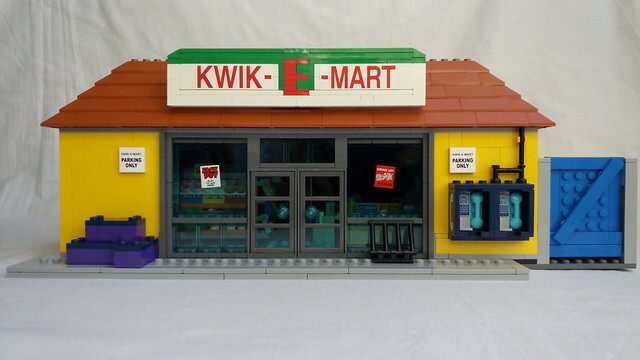 The front details of the Kwik-E-Mart store are dead accurate besides the colours. We have three purple creates at the left hand side. 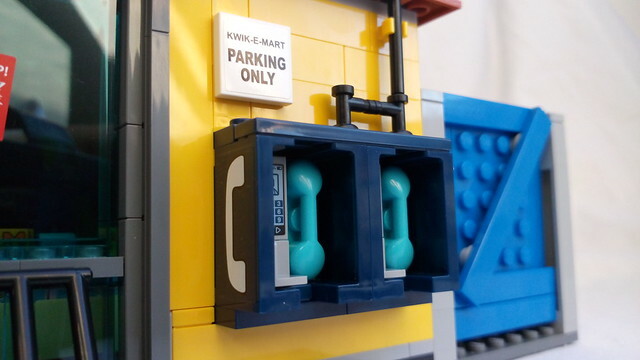 My personal favourite is the phone booth; it's very interesting how it's constructed. The front also has two stickered 'Flat Tile 2x2' with 'Kwik-E-Mart Parking Only' I don't understand why these were not printed. 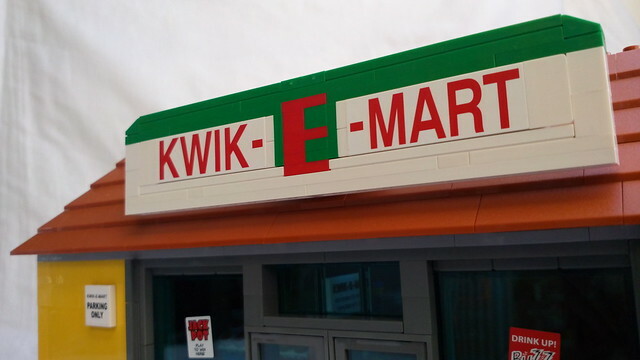 One complaint I do have is that the structure to hold the entire Kwik-E-Mart signage should have been grey but it would be very hard to do since how cool the sign is assembled, plus it's not necessary since the sign pretty much covers it from most angles due to its size. 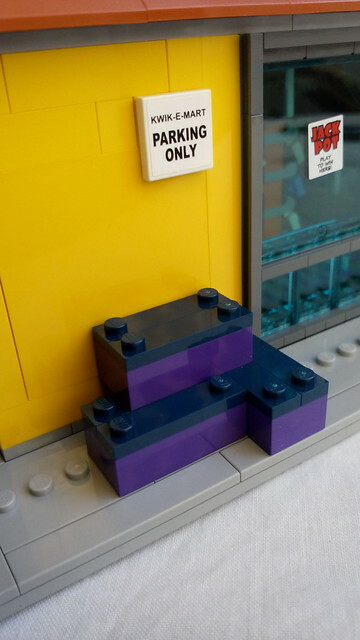 The stickers for the sign were exactly the same size as the 'Brick 1x2x5' and look much brighter than the white bricks which is very unfortunate. I like the way the signage is constructed, if it had brick built all the letters it would have been way too large considering it's already the perfect size. One thing Marcos avoided and that wasn't necessary was the same signage on the sides of the roof. They use a blue turntable base for the fan/generator on the right side wall of the store with more piping details going into the roof. I like the fact it has worn brickwork and several piping details on the walls. Continuing along the right we see another poster '30 Lost Cats...Call Me' referencing to the 'Replaceable You' episode. 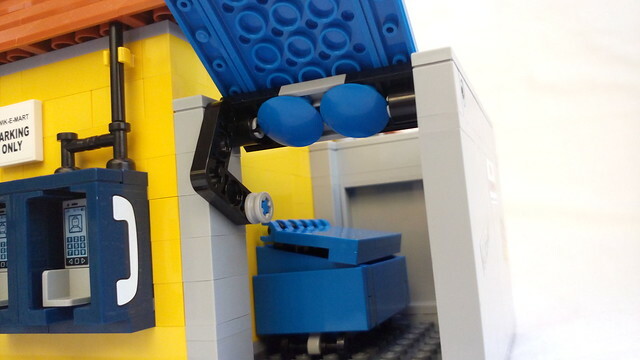 The dumpster area has a blue opening door which can be locked in place with a Technic piece and inside you will find the iconic blue dumpster. 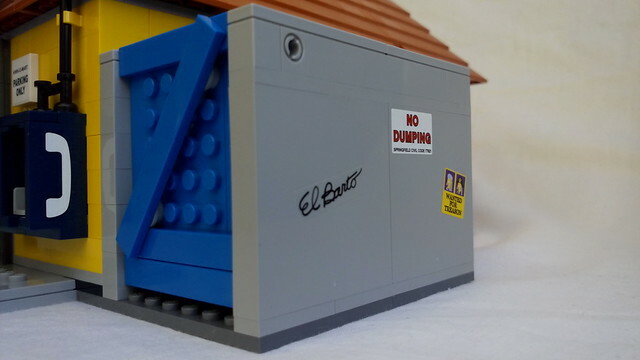 On the exterior walls of the dumpster area you will find some 'El Barto' graffiti, a 'No Dumping' sign and a 'Wanted For Treason' poster referencing to 'Lisa The Iconoclast' episode. The blue dumpster can open to reveal two 'new' black sacks. Another mouse would have been nice behind the dumpster. It would have been nice if you could also remove the dumpster area; for me it's causing display problems because it's too wide. The poster at the back 'The Leftorium...Next Right' is a reference to the episode 'When Flanders Failed.' The right hand side of the back has the back exit which has a blue door with an 'Employees Only' sticker. Next to it we see more weathered wall at the bottom and a mouse hole. 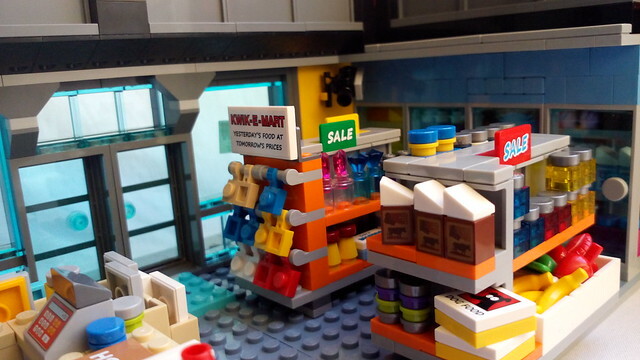 Moving to the last side of the store can see more of the pipes and weathered effect to make it more interesting. We see a purple poster 'Spider-Pig: The Musical' a referencing to 'The Simpsons Movie.' The final poster on the exterior the store is the 'Springfield Seafood...50% More Eyes' a reference to the episode 'Homer the Father.' The posters/ads on the exterior walls are really cool Easter eggs and referencing to the show; I just wish they gave us some extras! 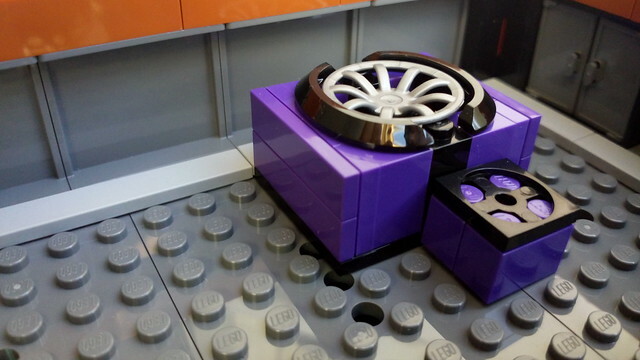 and the purple fan or ventilation. 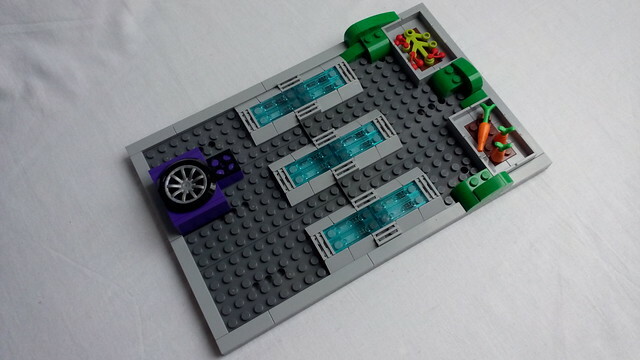 This set is very similar to the Green Grocer with the fridge/freezers. They are full decked out with food and groceries. 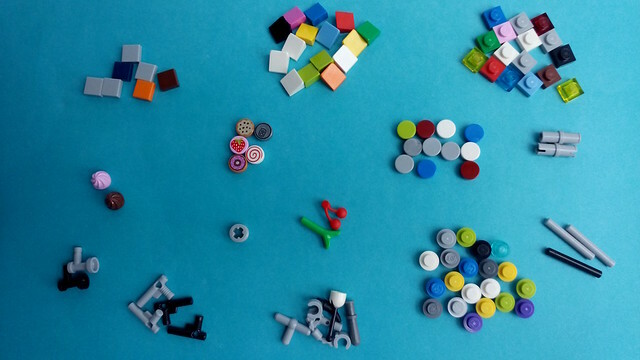 Most of them consist of 1x1 Bricks and cones as well as studs, 1x1 round tiles and cheese slopes. However they contain several printed pieces: four green cartons of orange juice, four blue milks, four chocolate milks and four Buzz Colas. One thing to note about the hinges in this is that they don't detract from the interior wall unlike the Simpsons House which did due to the chimney. This set it's all covered by the details that cover the walls and are only shown when the set is opened which is a much better improvement. The back of the store you can see the storeroom which contains a grey mouse and a slice of cheese. It's pretty small to get a photograph of when it's built. The door uses two stickers to give it the Keep out sign and the detail of the door. On the right from that we have a 'Powersauce' area with six bars of 'Powersauce' Note: all of those are stickers in this area. 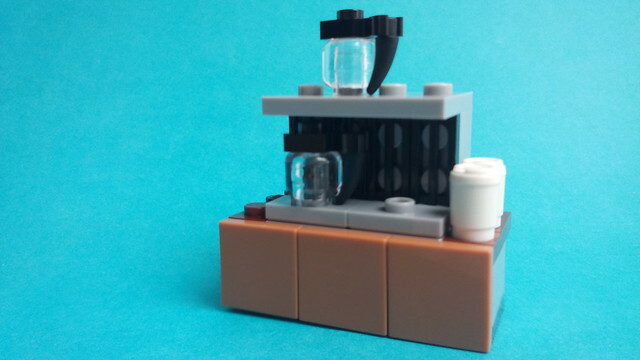 The coffee machine is fairly simple but the two cups are very neat. On the side we also have to plain white coffee cups. 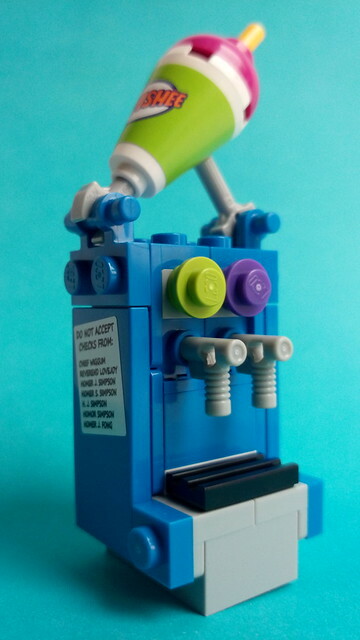 The next machine has red and yellow dispensers and it’s design is by far the simplest. 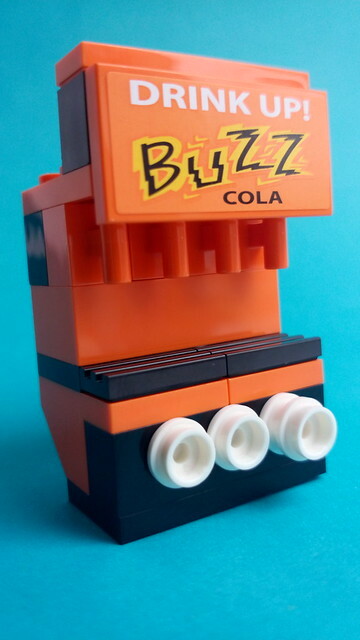 The Buzz Cola machine is another clever build which makes use of ‘Brick 1x1 W.Handle’ for the dispenser and it has studs used as cups at the bottom. 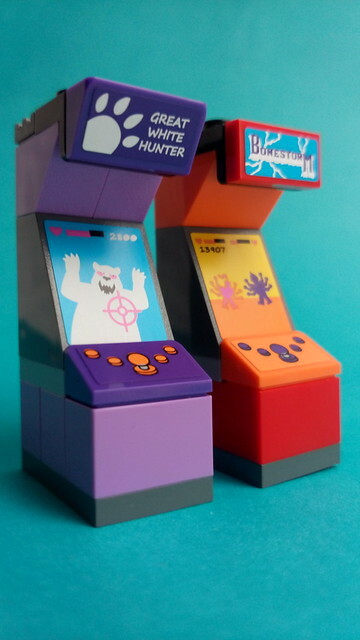 The two arcade machines are very cool, I completely missed that these were included in the set when pictures first released. They get the idea of arcade machines very well but feel they should have tiled the sides and added more stickers to complete the look. To be honest I don't think it's really possible fitting two that are wider, if they would have their would have only been one plus now that I think about it, it's already a tight squeeze and they aren't too revealing unless you take them out of the store. The second aisle starts off with three chocolate milks (I guess they are those powder mixtures since they aren't in the fridges. Below that we have two boxes of 'Dog Food' (one with a sticker) and another random product beside it. On the right of the aisle we have transparent bottles which are also on sale. Below them we have a fruit area with three copies (each) of bananas, green apples and red apples. 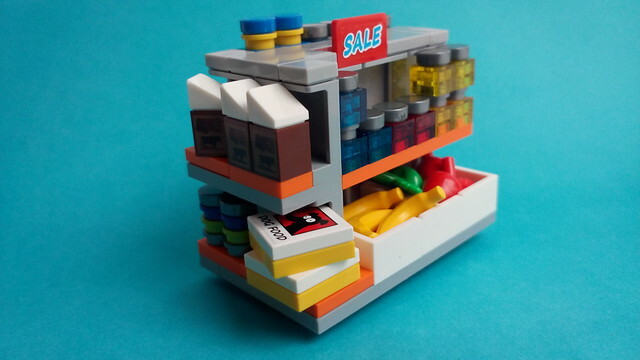 The left side we have some more random builds and finally we see the forth copy of Soup For One' which as misplaced by a customer, it's such a small detail but I really much appreciated it since it does happen occasionally when grocery shopping. 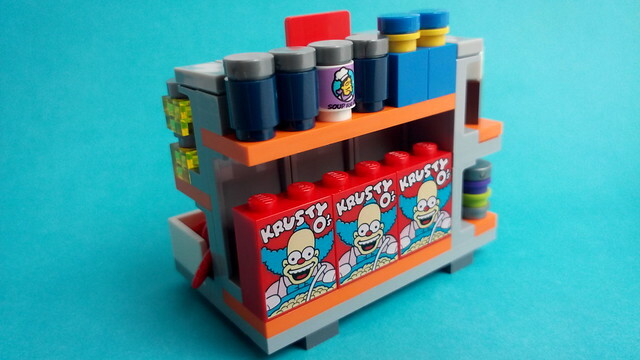 The final product on this aisle is three copies of 'Krusty O's' which are printed on a 'Brick 1x2x2' I don't know why they never tiled off the top to hide the studs. 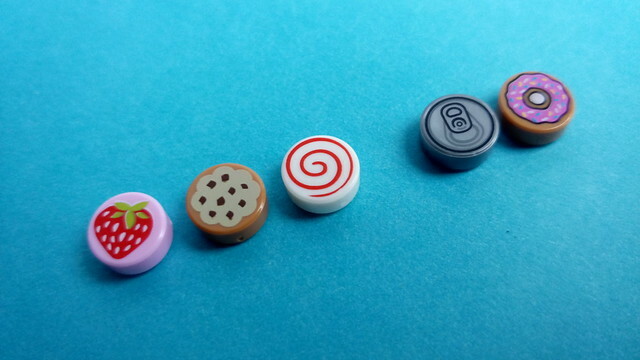 On the counter I would firstly like to start with the doughnuts, it's a very nice assembly which holds six doughnuts. In between the counter when it's split into two halves is a a fallen sausage. 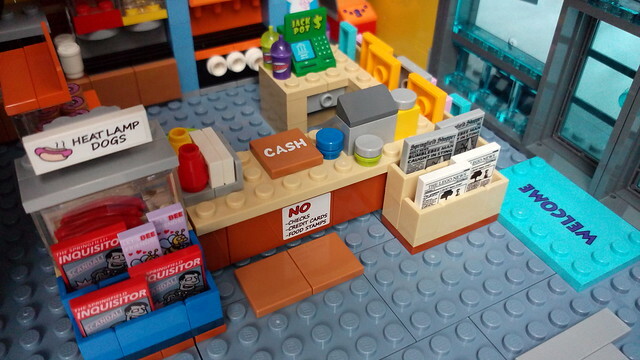 Coming towards the front we have the counter covered in a few products and on the other side we have two separate racks with two 'The LEGO News' three copies of the 'Springfield Shopper' three copies of 'MOM Monthly' three copies of 'Angry Dad' and two copies of 'You're A-Peeling.' Do note the 'Welcome' mat. The back of the counter we have a Jackpot machine and two Squishee's (lime and purple) besides that we have the actual Squishee machine which has a large squishiee cup. This is built is many different directions with uses of angle plates. All of those are exclusive to this set besides the two copies of 'The LEGO News' which are pretty common. This retails for £169.99 in the UK and contains 2179 pieces. The price surprised most us but in fact the footprint of the model is larger than The Simpsons House; then saw the designer video and was impressed with the size; now that I own its damn huge. The small details make the set pop out from other sets. This will do very well as an investment since it's a large set it may be over looked for its price. 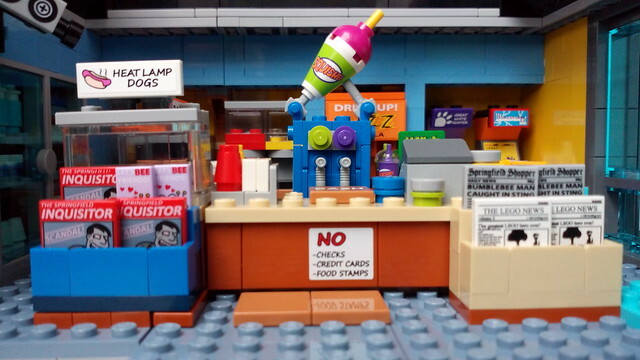 When I was at my local LEGO Store I saw many people admiring the model on display at the store but most people did overlook it. 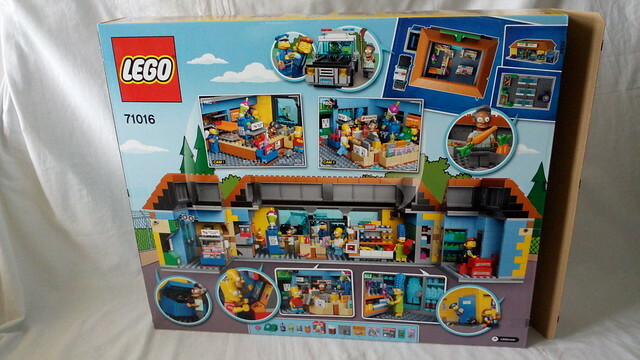 Another factor for this set would be its licenced pieces, stickers and minifigures as well as the other rare coloured pieces. Design: 9/10 – The unique comical style and colours are fun, its exterior is defiantly not detailed as the exterior but its transition between the show and the product is outstanding. 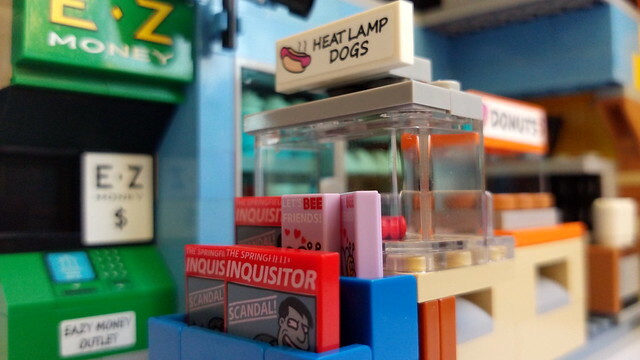 There are lots of small clever details, references and jokes all over this set. 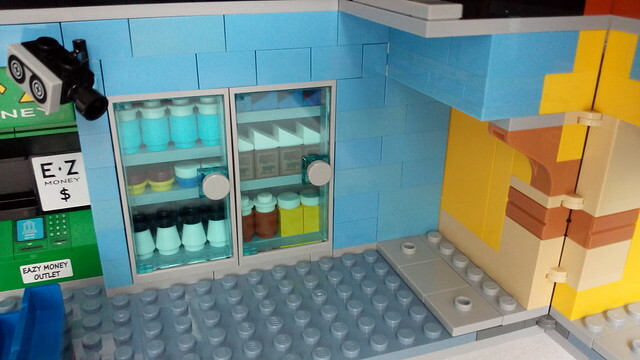 Build: 7/10 – The walls, roof and the fridge/freezers get slightly repetitive but other than that the small sub-assemblies and details are the most fun to build. 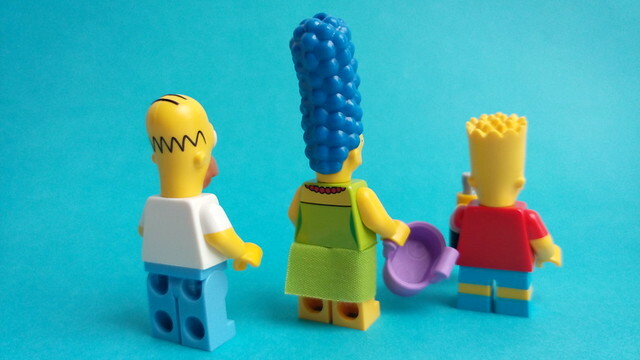 Minifigs: 7/10 – Homer, Marge and Bart minifigures are nothing all that special, but that's to be expected since they are the main characters, next time I hope we see different facial expressions or clothing. The two exclusive variants of Apu and Chief Wiggum are really nice and I hope to see more like them in the future. 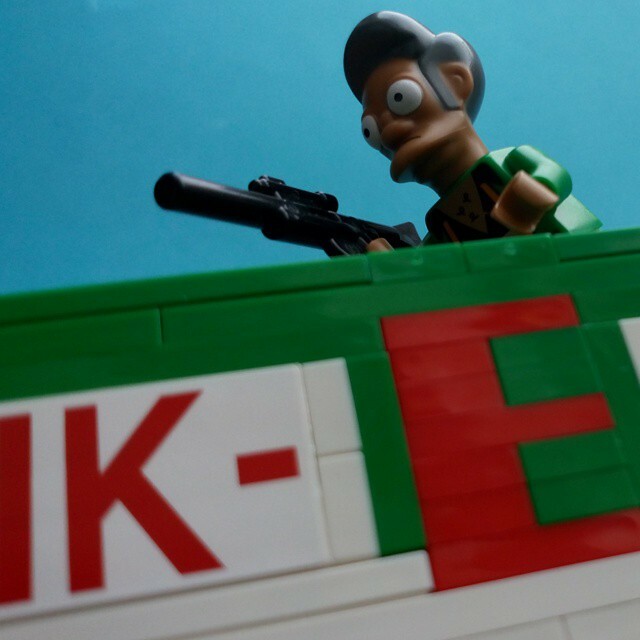 Finally the exclusive brand new character: Snake is a very cool addition to the Simpsons line up. Playability: 9/10 – This is exactly how old toys used to be where it was just one simple feature and your imagination does the rest. 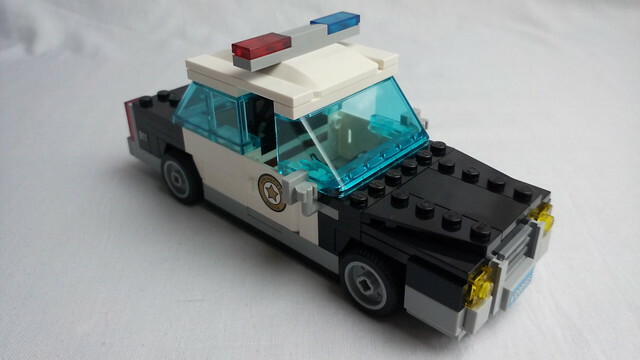 The addition of the police car would be great for little kids to have a small car chase with. 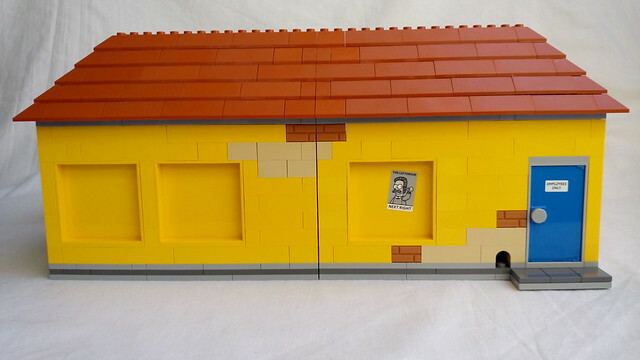 Parts: 9/10 - Like the Simpsons House, this set has many bricks in new and/or rare colors such as the Sand Blue plates. 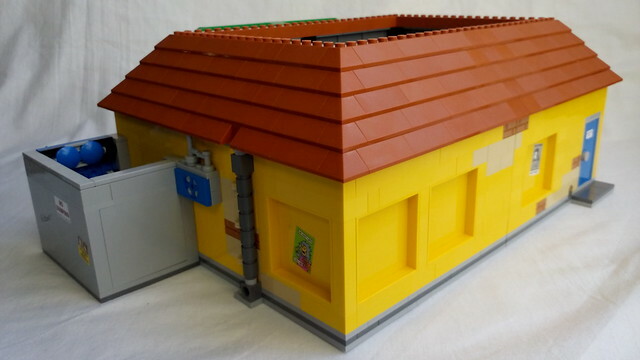 It also has several exclusive printed parts and a ton of those roof tiles. 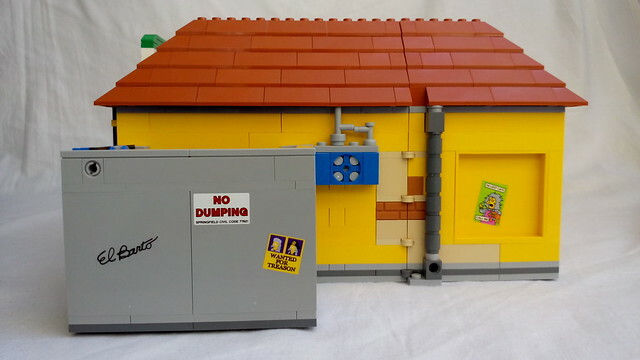 Price: 9/10 - 2179 pieces seems low for the price considering the Simpsons House had over 300 pieces more, but I'd still say it's a fair price for a model of this size, plus is licensed. Overall: 9/10 – Yes the total average doesn't add up but to be honest it’s close to perfect beside some small things. I got this before the Simpsons House simply because it’s got much more to it. 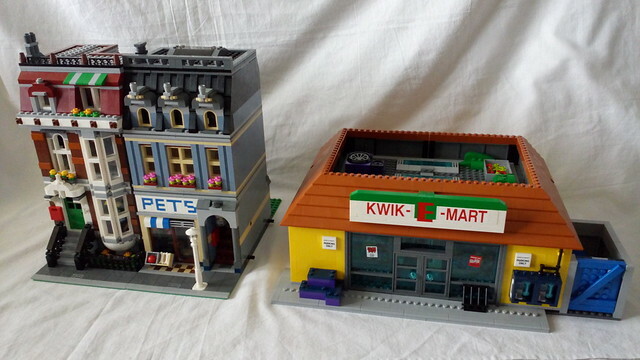 It’s got so many more references and small details from the show which makes these sets much loved my fans of the Simpsons and people who are building LEGO City layouts. 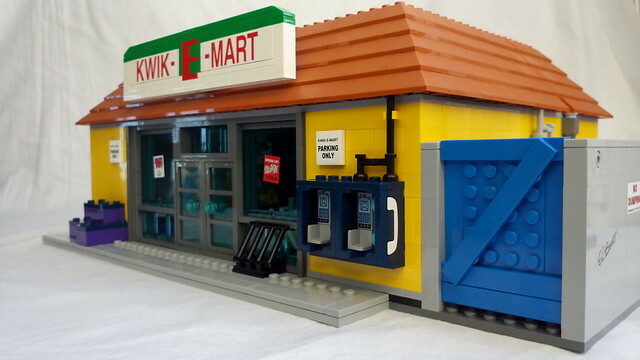 Next year I hope we see The Android's Dungeon & Baseball Card Shop with tons of comics and maybe even an exclusive Radioactive Man minifigure. I really hope you enjoyed this in depth review; feedback and criticism is much appreciated. "Thank You For Coming! I'll See You In Hell!" Great review! 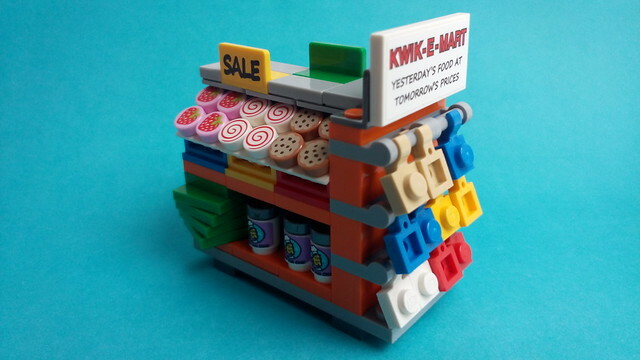 I'm not going to be collecting Simpsons, but all of these great details make me want the set so I can stock up a modular grocery store. Still--all the stickers and the high price tag will make me hold off. Thanks for the review and I appreciate that you have shown all of the shelves in detail. 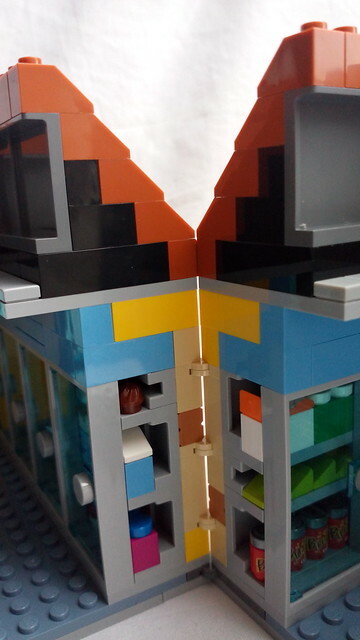 Is it correct that there are 7 chocolate milk, 4 milk and 4 orange juice printed 1x1 bricks included? 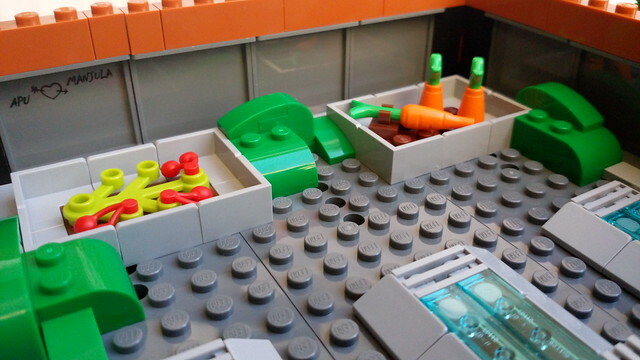 Together with the cookie tiles, magazines and food utensils you finally get a nice and big selection of food parts, unlike most sets that are always really niggard with utensils and printed parts. I already have a big collection of food pieces but for a beginner this would be a great starter kit. Nice to see the red apple becoming more common, though I would love to see the annoying green apple banned from Lego sets for a while like they did with the red apple for so long so I can finally get a nice number of red apples together faster. Only missing some reissues of brown popsicles, flesh sausages and brown ice cream balls. Thanks for the great review! 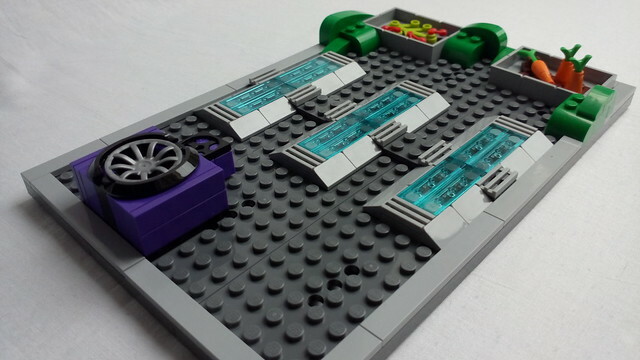 Does the building fit on a 48x48 baseplate? I actualy love fact there are so many usefull stickers! And probably City-folk will love fact that they will not have to have Simpson-only pieces and have a big supermarket shop for their cities! It's very unfortunate to get stickers in an expensive set but you would be coming a crime if you didn't; most of them could have easily be printed but I guess they are giving you the option since it is a large amount. It would be great to get extras since some of them are reusable. 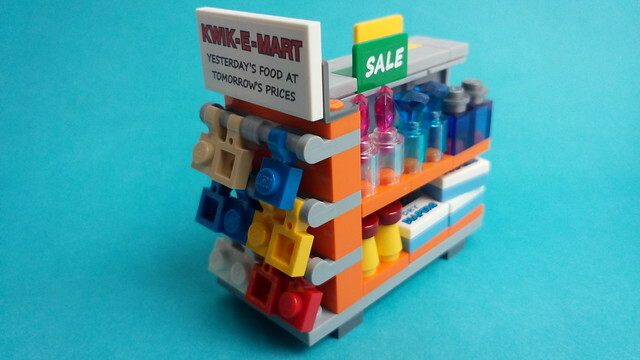 Yup, Your right it's a great starter for food related collections or MOC's. I wonder why you hate the green apple so much? 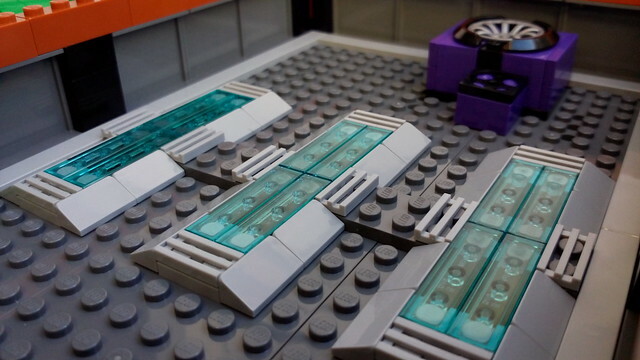 The front fits exactly (including the dumper area) on a 48x48 baseplate and the side covers most of the baseplate but leaves about 1/3 of space. Adeel Zubair, thank you so much for taking your time to do such an incredible reviewing feat! 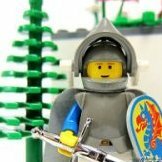 It is awesome to see such a nice review to be shared with the Eurobricks Community. I am saving up for this set. I was on the fence about getting the Simpsons sets, but reading your review, I've come to the conclusion I do need to get them. Great work on your review! Great review, I'm hoping to get this set later this year. 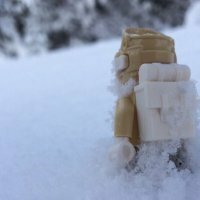 Fantastic review and pictures! You have a great knowledge of the show which I appreciate being a huge Simpsons fan. I got half way through your review and went to LEGO.com and put in my order. The detail is second to none and as you mention there are so many clever references to the show I couldn't wait any longer!! Thanks for the review and happy building!! Oh, those coffee cups are stolen. This one, too. With more colors it'd look like the ones for Coke, Pepsi, or Slurpee. and this, the star of the show. 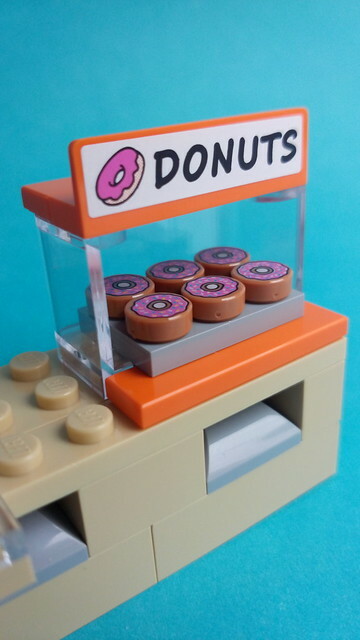 It'd be nice to see more of the ATM machine, but these little builds, together with the aisles, the fridge and the Donuts, add so much charm. 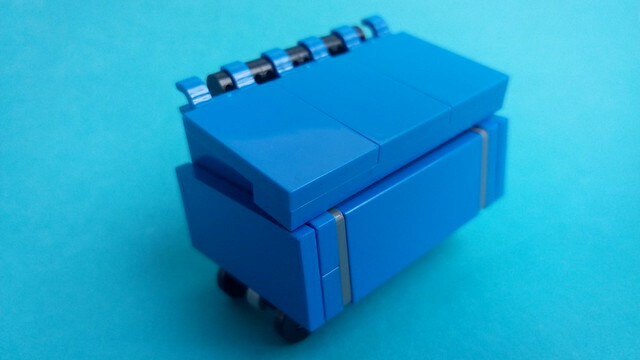 And they give me loads of ideas for dispensers and counters for some future Creator-style houses and/or camper builds. This review really makes me want this set! I LOVE the mini builds. I'm about a third done building mine and flat out love it. There's SO much detail crammed in here and clever building techniques for all these machines. Just fun to build. I particularly love the design of the coffee pot though, I don't know if these have been done before but I think they are just perfect. There are many stickers. 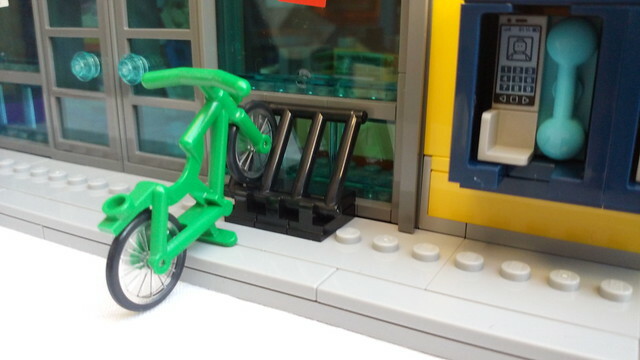 But also many printed bricks: So, I'm fine with that. 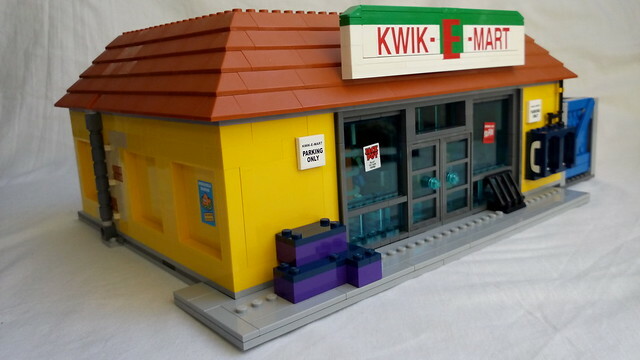 And I really do enjoy all the details inside: I think, (not only because of this) the Kwik-E-Mart is very similar with the last two Creator Expert modular buildings. So, why not put this building in the town? Is there a staircase to access the roof garden? Finished mine last night, really enjoyable build (although I made a hash of a couple of the stickers, actually put jasper on upside down and had to peel it right back off). 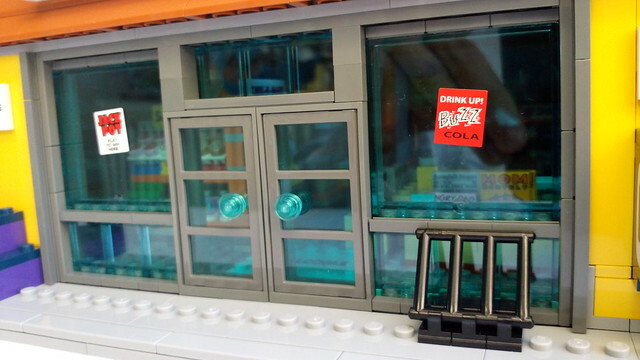 My only real criticism is it should really have sliding doors instead of normal ones and there's no bottle of Colonel Kwik-e-Mart's Kentucky Burbon. 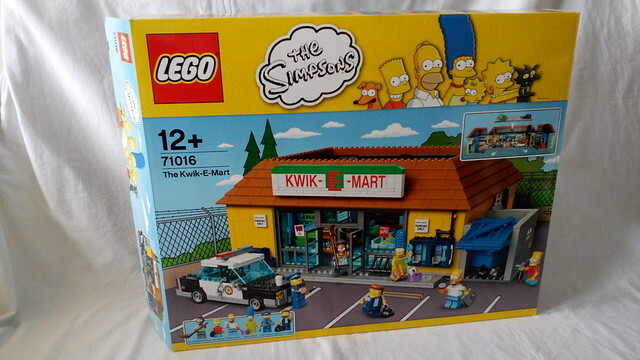 Mine is on the way - I'm not collecting Simpsons, but as a set it is unmissable for integrating in to a city layout. Thanks for the great review. This set looks awesome! Mind if I stil that Chief Wiggum pic for my avatar? I love it! Good review, thank you. I'm not totally convinced yet, mainly because it's just a one floor building. But, I guess it's not about the building, it's about the details. I love this set very much! But when saw the amount of stickers in your review.... I am appalled!!!! Oh goodness me!!! !